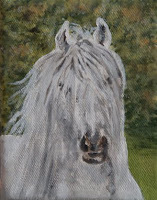 Dales mini painting number 3 (8" x 8" oil on canvas) finished! All of these mini paintings will be available for sale at the Yarm Originals Exhibition taking place at The Parkmore Hotel, Eaglescliffe, on the 15th November- prices for them will range from £30 to £120. I have continued the backgrounds of the mini paintings around the edges of the stretched canvas so that they can eother be hung as they are (like tiny deep canvases!) or be framed traditionally. You can see all the original work I have available for sale on the Gallery section of my website. 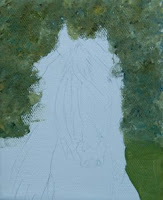 I continue to potter about on mini painting number 4, pictured below. 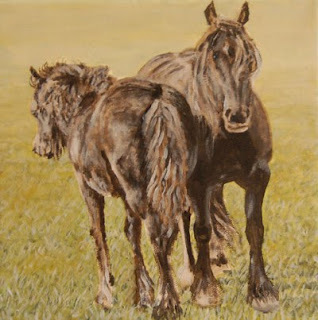 Bit more done on the mare and foal, not much left to do now- just some reddy tones in their coats, the tiny detail, and tying the background in. 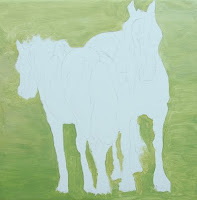 A little bit more done on both, still quite a bit to do on the mare and foal, and obviously lots to do on the stallion! 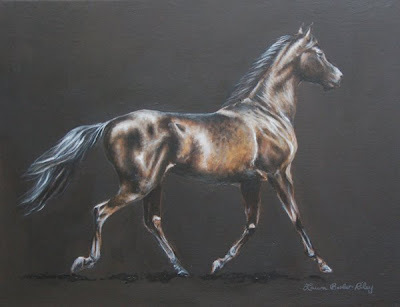 Off to drop 'Between Fences' and 'Dark Horse' off this afternoon at Darlington Art Centre for the Darlington Art Society Exhibition which starts on Saturday and runs until the 27th November. I have never exhibited locally before so I'm looking forward to it. I have got the bulk of the background done on the 8" x 8" pictured above, and roughly sketched in the darkest values on the ponies themselves. I have made a very quick start to the smallest of these mini paintings below- 4" x 5"! The background colours have been very crudely blocked in ready for some detail to start going on once dry. This tiny one, and the final painting of series (left to do, which is I think 8" x 10") are of a particularly handsome grey stallion called Bobbie who I had wonderful fun photographing in the summer- he was quite happy to strut his stuff for the camera with very little encouragement! 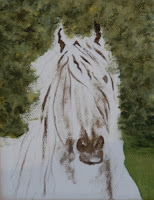 Mini painting number 2 completed (5" x 10" pictured above), and number 3 started below! I *think* number three is about 8" x 8". Only one month left until my second baby is due so I'm working hard to get as much done as possible before then! Just one pencil drawing commission to finish off, and one medium sized oil commission and then I can stop worrying about getting peoples' Christmas presents completed and use any spare painting time I have to potter about on my original stuff without any time worries! Feeling very glad I didn't take on too much work leading up to my due date as I'm absolutely shattered!! 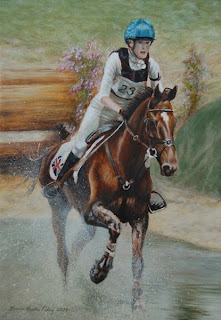 A very special painting commissioned by a group of Horse and Hound Online Forum members for Laura Shears following the tragic loss of her wonderful mare Connie (Wulston Rock On) in September. 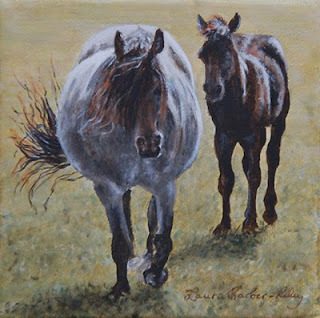 I have started a series of 5 very small paintings based on photographs I took at the wonderful Nipna Dales Pony Stud over the summer. Two of the paintings are underway, the one pictured above is a very tiny 5" x 5" and just has the finer details left to go on before it's finished. 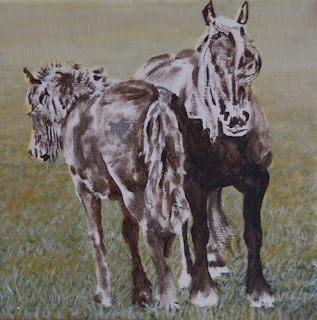 The one below is 5" x 10" and halfway through having it's background painted in (it's of a beautiful fluffy foal lying down in case you can't make it out!). These little paintings have been perfect to potter about with inbetween work on commissions, I am very much enjoying them! I thought there was plenty of work left in this but all of a sudden it was finished! 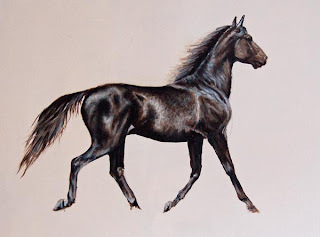 I have been so engrossed in commissions requring such close attention to detail and accuracy recently it was so nice to be able to be more creative and have some fun with this one, I really enjoyed painting it! It will now go off to the framers ready to appear at the Darlington Art Society Annual Exhibition which takes place at the Darlington Arts Centre from Saturday 31st October through to Friday the 27th November 2009. 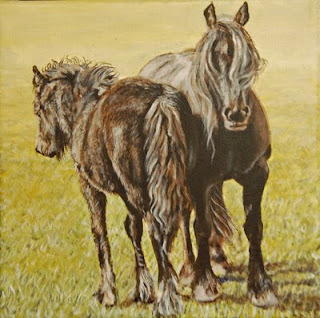 'Between Fences' will also be available for sale there. Have done small bits and bobs on this between commissions. Tried a smudgey smokey brown background first but it didn't work at all- the whole thing looked a mess! Since then I have put a dark grey background in which I'm much happier with. 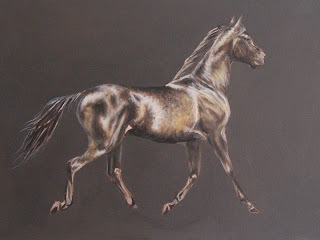 Have put a transparent layer of gold ochre over the brown points of the horse and then picked the highlights and lowlights out again. It's looking quite dramatic now which I quite like! Quite a bit left to do, need to get a move on to get it to the framers in time!!! Really need to think of a title for this as I'd like to enter it into the Darlington Art Society exhibition and my entry needs to be posted off in the next few days! 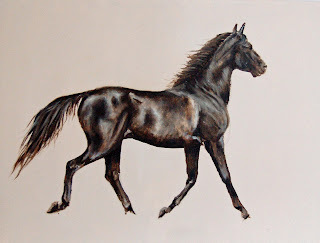 Thinking of adding quite a dark smokey kind of background now as I want to keep this one simple, and think it will compliment the colours of the horse which should stand out nicely against it. In theory haha! Anyway, after spending hours and hours on commissioned work today I managed to stick another layer on this. Almost ready for some colour now, just need to sort his face out a bit as I have made a bit of a muddle of removing his bridle and his head is at a bit of a tricky angle too. Once dry I can have another go at getting it right!